Imagine the tales that objects could tell if only they could talk. Hannah Rothschild has done just that. 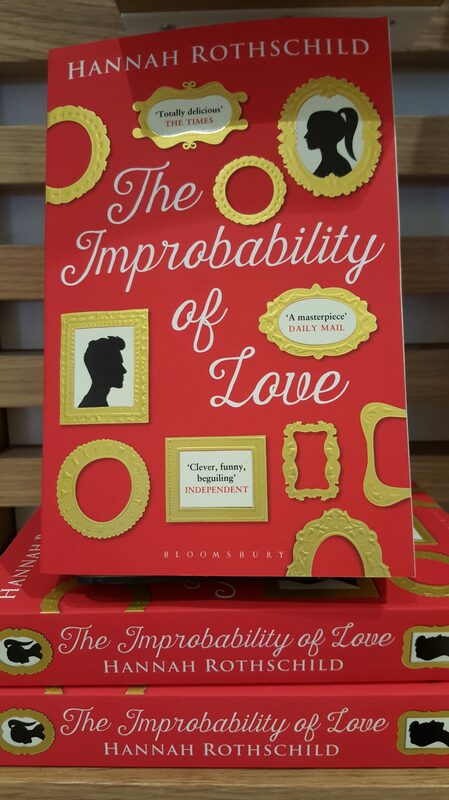 THE IMPROBABILITY OF LOVE is an eponymous painting who tells her own story. The action starts as our heroine is set to become the most expensive painting ever sold at auction, then we wind back to her discovery in a junk shop. Lovelorn Annie McDee buys our heroine, pops her into her bicycle basket and cycles home. Turns out she is no junk shop staple but rather a lost masterpiece with powerful people on her tail. As the story twists and turns we me meet Arab sheikhs, Russian oligarchs, American philanthropists, German emigres turned art dealers, English socialites and a British aristocrat on his uppers. We glimpse inside the world of fabulously expensive art. A world where possession means more than appreciation and where people will stop at nothing to own the correct work of art. All the characters are sympathetically drawn, even the baddies you feel sorry for. THE IMPROBABILITY OF LOVE was one of those books that had me hooked, the house went untidied and children unfed whilst I sat with nose in the kindle until the very last page. Best of all Hannah Rothschild ties up all the ends with a thumbnail sketch of what each of the main characters goes on to do. DISCLAIMER: I was sent an ARC by NetGalley in return for an honest review.